Security workers at Orlando International Airport are being shown the District of Columbia driver's license after one agent's apparent confusion over its validity. 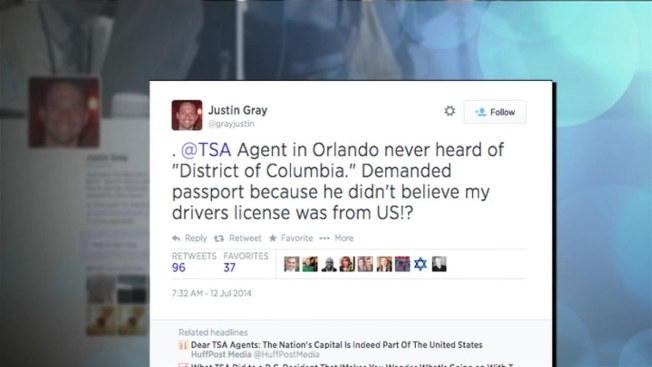 Cox Media Group television reporter Justin Gray was heading back to D.C. over the weekend when, he says, a Transportation Security Administration agent didn't recognize his license. The TSA agent asked for a passport, but Gray wasn't carrying one. He said that after further back-and-forth, he realized the agent was not aware what the District of Columbia was. Gray eventually made it through security and voiced his complaints to a supervisor -- and the rest of the world, via Twitter. He tweeted that Washington is "a bizarre place'' but a passport isn't needed. All Orlando TSA agents are being shown copies of the D.C. driver's license, WFTV reports. Back in February, a D.C. woman flying home from Arizona was also questioned about the validity of her D.C. driver's license. "I got a little nervous," Brandt said. "I just wasn't sure if the TSA didn't think it was a valid ID or it was because D.C. wasn't a state." Brandt said the man asked for her passport, which she didn't have with her. Luckily, the confusion was short-lived and Brandt made it home without any delays. But flights aren't the only thing those with D.C. driver's license seem to have a problem with. Apparently, having a D.C.-issued driver's license can prevent you from buying alcohol in New Hampshire. A quirky state law doesn't allow people from the District or any U.S. territory from purchasing alcohol at stores with a license. Travis Mitchell, a 25-year-old D.C. resident, experienced this firsthand during a visit to his hometown earlier this month. According to the Washington City Paper, Mitchell went to a store to pick up some beer and was told that his license couldn't be accepted because D.C. isn't one of the 50 states. "We always hear about these stories of people not accepting D.C. IDs for things, but you never really believe it," Mitchell said. "The cashier flagged a manager down, said 'We have a D.C. ID,' and we were told they wouldn't accept the ID due to state law." A passport or military card is an acceptable alternative. Some store owners let it slide, but others say they have to follow the letter of the law.